Let's talk about the FormLayout, and why the anchor system makes it much more flexible than just a simple grid. From these five the first four are easily explained, only the FormLayout needs some more information because it might not be as easy to grasp in the first moment than the others. 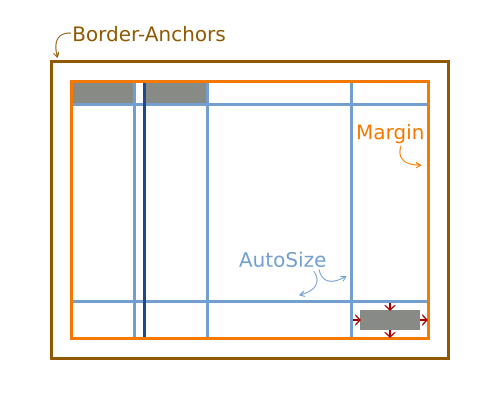 AutoSize-Anchors, its position is calculated from the component assigned to it. Fixed-Anchors, its position is fixed. 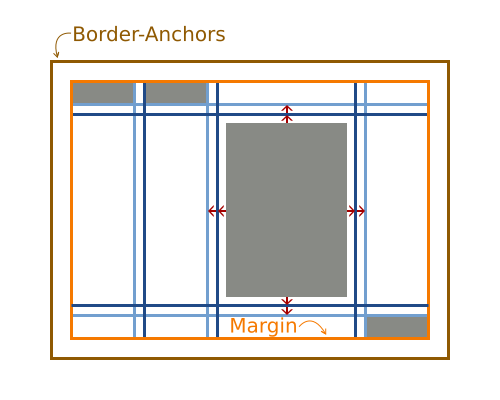 Border-Anchors, which surround the FormLayout at its border. 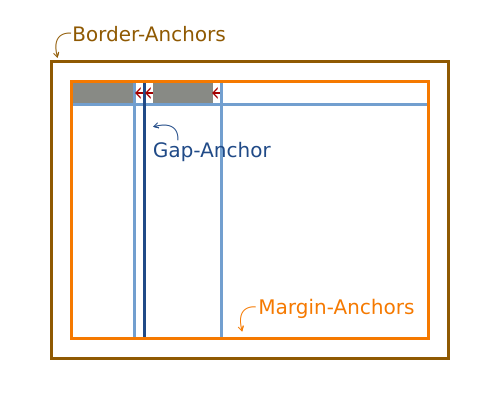 Margin-Anchors, which are inset from the border by the defined value. Gap-Anchors, which are added to create a gap between components. 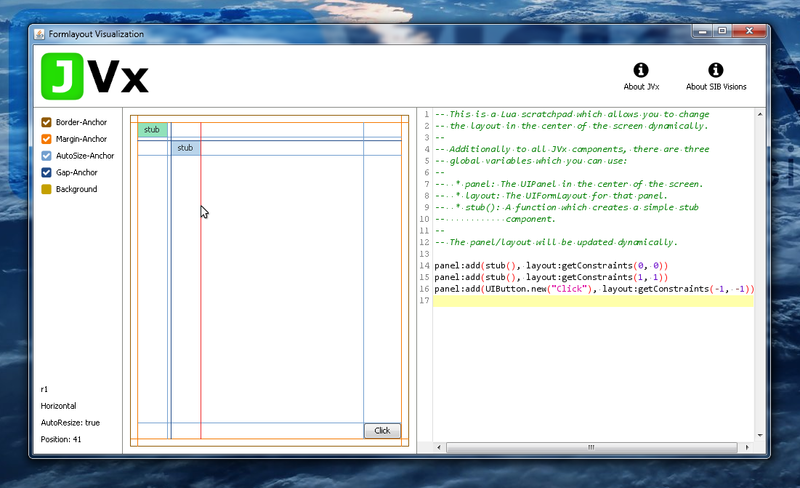 With this knowledge, we are nearly done with completely understanding the FormLayout. 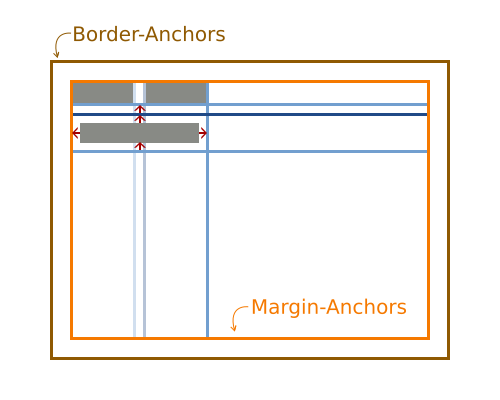 With the coordinates of 0,0, no new anchors are created but instead the component is attached to the top and left margin anchor. Two new AutoSize-Anchors (horizontally and vertically) are created and attached to the component. Because we are still on row 0 the component is attached to the top margin anchor and the previous AutoSize-Anchor for this row. Then, a new Gap-Anchor will be created which is attached to the trailing AutoSize-Anchor of the previous component. What happens is the same as when adding a component at the coordinates 0,0, except that the reference is the lower right corner. The component is attached to the bottom and right margin anchors, with trialing AutoSize-Anchors. The component is horizontally attached to the left Margin-Anchor and additionally to the AutoSize-Anchor of the second column. The AutoSize- and Gap-Anchor of the first column are not ignored, they are not relevant to this case. At this point it is important to note that spanning and stretched components are disregarded for the preferred size calculation of the layout. So whenever you span or stretch a component, it is not taken into account when the preferred size of the layout is calculated, which can lead to unexpected results. Sometimes, however, it might not be obvious what anchors are created and how they are used. For this we have created a simple interactive demonstration application which allows to inspect the created anchors of a layout, the JVx FormLayout Visualization. 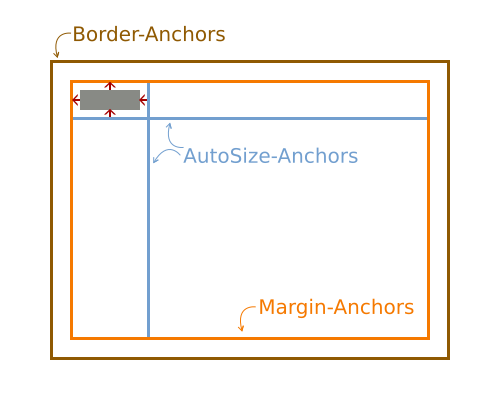 On the left is the possibility to show and hide anchors together with the information about the currently highlighted anchor. 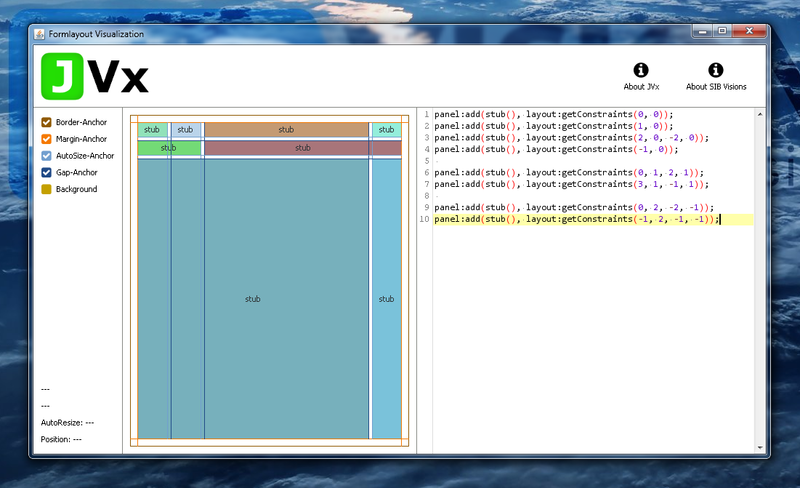 On the right is a Lua scripting area which allows you to quickly and easily rebuild and test layouts. It utilizes the JVx-Lua bridge from a previous blog post and so any changes to the code are directly applied. It does not require any interaction from us except adding components. In this case, when three components have been added, the next one will be added to the next line and so on. This is quite useful when all you want to do is display components in a fixed horizontal grid. With the main difference being that the columns and rows are sized according to the components in it and not given a fixed slice of the width of the panel. 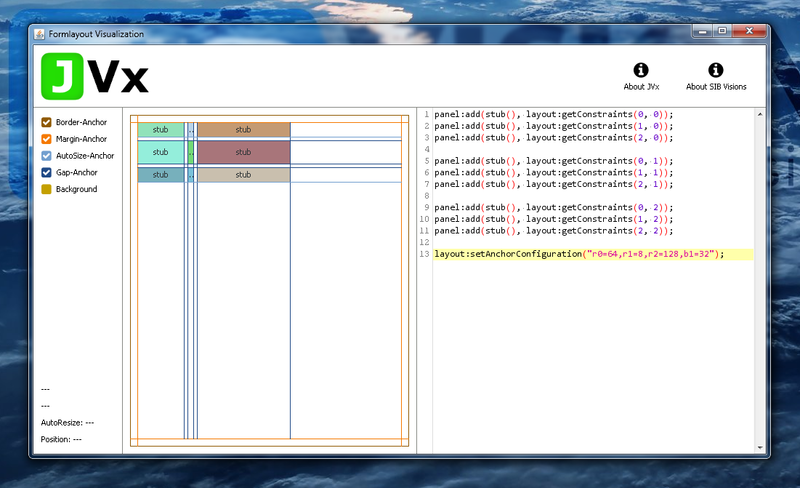 Together with the ability to span components, this allows to create complex and rich layouts. The JVx FormLayout allows to quickly and easily create complex, good looking and working layouts which are still flexible enough for the cases when a component is swapped, removed or added. It can be used in many different circumstances and is still easy enough to use to make sure that even beginners are able to create a basic layout within seconds.